Castlevania fever is running high at the moment, with Simon and Richter Belmont arriving in Super Smash Bros. Ultimate in December, a new season of the Netflix series airing next week, and this month's release of Castlevania Requiem (which sadly won't be making it to Switch). Naturally, this means that eager fans of the series are in a pretty 'Castlevania mood' right now, and this includes Disney artist Vince Aparo. Aparo is a storyboard artist for Disney Television Animation - the animation production arm of Disney's world-dominating business operations - and just so happens to be working on the new DuckTales reboot series. With the second season of the show coming up soon, Aparo wanted to share an art piece which combines two of his favourite things. 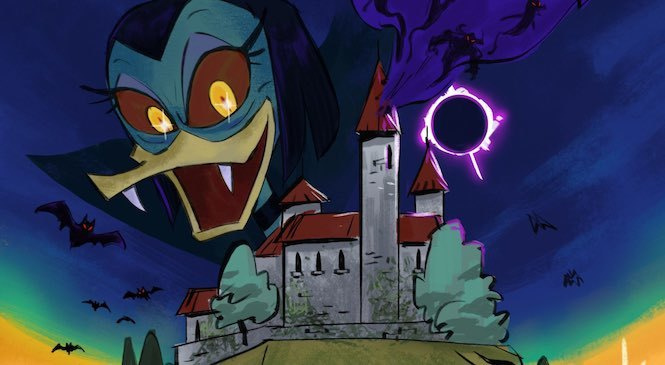 If you're also a fan of both franchises, you'll likely be aware that instead of Dracula chilling over the castle, this image depicts Magica de Spell complete with fangs and glowing eyes. Also, Simon Belmont has been replaced by DuckTales' Launchpad McQuack to complete the crossover. It's a frighteningly good mash-up, we're sure you'll agree. I can still sing the theme tune for Count Duckula to this day. This mainly just reminded me that Disney Afternoon Collection isn't on Switch for no discernible reason. The reboot series is truly something else. They should get WayForward and/or Yacht Club Games and have them do a new sidescroller for the occasion. I would totally play something like this! I loved the DuckTales series back in the day, and Remastered was a decent remake. @AlexSora89 I've watched most of the first season, and I like it, but I can't say I'm blown away. Granted, I'm too young to remember the original series, so I don't have nostalgia for Ducktales or even really know anything about the source material the reboot is based on. The jokes generally fall flat (I thought Launchpad would be one of those dumb, lovable comic relief characters like Soos, but more often than not I just found him kinda cringey) and the characters feel pretty one-dimensional to me outside of maybe Lena. The overarching plot feels a little vanilla to me as well; the "What happened to our mom?" trope has been done to death already in other cartoons like Avatar: The Last Airbender. I appreciate the continuity between episodes, and the writing is pretty good. I do feel the conflict in most episodes is resolved with a deus ex machina, which is a bit annoying. Probably my favorite episode is the one where they visit Donald's brother at his casino home, which has a pretty good plot twist, and the visuals in that episode with all the neon lights at the start were really nice. The show has a good, comic-style art direction that stands out against most cartoons that adopt the "Cal Arts" style. The show definitely has heart, both in terms of animation and writing, and the voice acting is pretty great as well (aside from Donald, who I can never understand). I feel like I've done an entire review here, so I may as well give it a score. I give the DuckTales reboot a 7/10. As someone who has never seen the original, I can't compare the two. But for what it is, I think it's a slightly above-average cartoon that doesn't quite stack up to many of the cartoons I loved from the early 2000's era but is still a good show in its own right. I would say it's one of the only good cartoons presently airing new episodes, with the only other ones I can really think of being "Star vs. The Forces of Evil" and "We Bare Bears." First things first: Gladstone is Donald's cousin, not his brother. The show is mostly sticking to the comics' canon as far as characters go, and the fact Fethry Duck and John D. Rockerduck are finally going to make the leap to animation is getting me excited beyond belief. 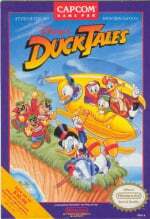 I see how you're too young to remember DuckTales (me, on the other hand... 1989 kid right here, heh heh! ), but I'm not that blinded by nostalgia and I see some changes (aside from turning Doofus Drake into a complete psychopath, which was kind of uncalled for) being for the better (Webby becoming a feathered Mabel is just perfect for me). Sure, Magica DeSpell was truer to her comic counterpart in the 1987 show, but that aside everyone else was pretty much nailed (Gladstone above everyone else). I'm amazed at how the show, especially in the wake of competing network CN defiling every show they've been rebooting lately, made DuckTales - as the Nostalgia Critic put it best - "both classic and retro". 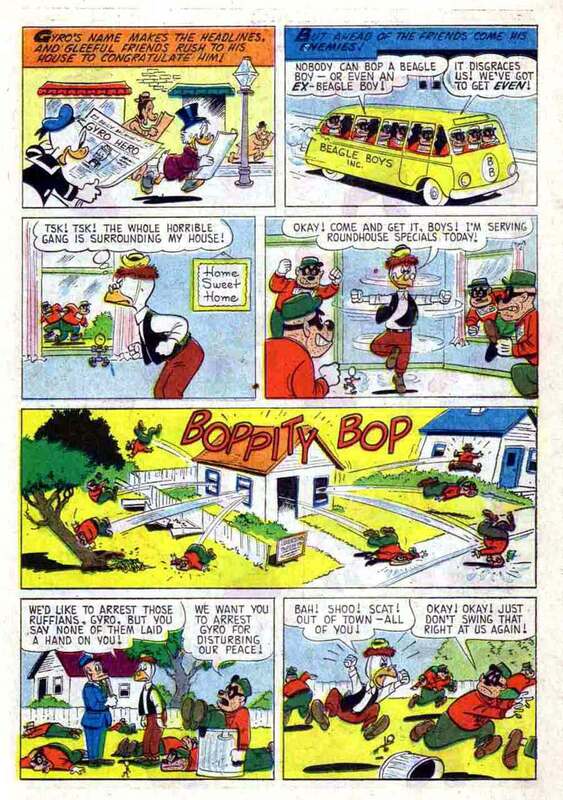 The writing is top-notch to me, and I'm surprised at how some of the more audacious jokes and dark moments manage to fit in the Duck lore, built by comic book writers Carl Barks first and Don Rosa later back in the day, without looking like something straight out of a damn Family Guy episode. The missing mom arc has to be contextualised too - done to death as it may be, it's also the first time the "parents taboo" the Disney canon is infamous for has been broken on such a big scale (Della Duck is a character in the comics, but rarely, if ever, mentioned - even the Italian comics, which boast some of the finest comic book storylines at times, use Della Duck once in a few years, basically the Disney comics' equivalent to Nintendo's "threshold strategy" I often alluded to on this site) as an animated show aimed at a worldwide audience. As for Donald, if you focus, you can understand what he says (Kingdom Hearts' famous subtitled cutscenes are a good training for that) but the writing always makes sure it's not vital (and when it is, they get Don Cheadle on board, apparently). The only flaw I can think of, as far as DT2017 is concerned, is that it shares Gravity Falls' infamous tendency to get on hiatus every time it pleases (well, not really "pleases", as Disney Channel had the ever-so-bright idea of retooling a snowy episode into a Christmas one, so I guess the showrunners have a fair deal of network-screwing to deal with); other than that, is a great nostalgic throwback to me and the perfect "my childhood grew with me" show for the time being. It's a 8.5/10 for me at the very least, but there's never any accounting for taste, so your viewpoints are still valid to me. The new series is trash. End. Starring Launchpad McQuack and Magica De Spell. I'm not sure even the Great Simon Belmont can handle Count Duckula !!! Very cool art! I really enjoyed the Ducktails game reboot on the Wii U a few years back and would definitely love to see another game with the franchise. I’m with you, I think the TV reboot is great. I grew up with the original and I think it serves it well. 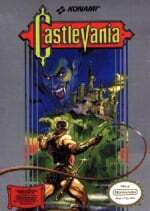 @oatmaster I got one would love to see a Castlevania with Dr. Von Goosewing hunting down Duckula. @RadioHedgeFund whole sections where you're battered by an indestructible Nanny appearing at random. I like this! Here's hoping Launchpad Crashes the Party! He literally crashed on top of Magica, adding insult to injury! "Huh. Never crashed a Me, before." @RadioHedgeFund Have you ever seen the Danger Mouse reboot on Netflix? Duckula's a Vegetarian Vampire Duck again, but he's still evil, not just brainwashing the populace and turning the hapless victims into literal vegetable zombies, but also still wanting to be on TV. You need to see a staffer of Danger Mouse do up this piece, but with Danger Mouse wielding the whip, and Count Duckula looming in the distance. @tsdenizen Ever think that Nintendo could port the individual Games on the NES NSO App, where you could play Chip n Dale: Rescue Rangers 1 and 2 with Online Multiplayer? Nice to see someone agreeing! I'm a teeny wee bit conflicted on Magica DeSpell ditching her Neapolitan citizenship from the comics (the original Carl Barks joke consisting of Magica DeSpell being a witch as beautiful as an actress - and southern Italian then-bombshell Sophia Loren fitting that bill nicely - rather than the usual old hag stereotype) in favour of more Doctor Who pandering - following David Tennant nailing his role as the late Alan Young's successor - but thankfully the Italian dub gave this new take on the character back her Neapolitan accent from the 1987 original (and from the localized version of the PS1/N64 Donald Duck game Goin' Quackers, for those curious), in exchange for an unfittingly young-sounding replacement for the unforgettable, late Gigi Angelillo (whose said replacement is himself another point of contention). All in all, though... the new show pretty much nailed it. Hell, Huey, Dewey and Louie aren't palette swaps of each other anymore, and they're far better off this way rather than the single-minded clones Disney's given us ever since their debut in the original 1938 short. @YoshiAngemon not impossible, but unlikely. One, there are other, bigger NES games that have versions on Switch outside of NSO, so having those but holding off on Disney Afternoon because games were coming to NSO doesn't make much sense. Beyond that, in order to have it make sense to not put the collection on the system, they'd have to do all six games, with updated features, for free. That doesn't make sense from a business perspective when the Disney Afternoon Collection port would be less work for more money. I think it's a lot more likely that we see the collection ported next year than seeing any of the games on NSO, and even then, I'd say the port is a 50-50 chance. @AlexSora89 Don't forget that rare occurrence where they all said "ANTIDISESTABLISHMENTARIANISM! SERIOUSLY?! GAH!" @AlexSora89 I don't think she was specifically Neapolitan outside Italy. She was Italian, with her hut being located near Vesuvius, but I don't remember her being called anything more specific than "Italian" in Polish comics. @Not_Soos I received a small collection of the original episodes in VHS format so I enjoy the original better than the reboot. But the reboot is Meh..
@AlexSora89 I do like there differences in the new series as well. I’m pretty satisfied with it and just want more shows. I think most of the character changes are good and overall it delivers that Ducktails feeling pretty damn well. We just need to get a new game going! Many replies! I guess I'm gonna do the multi-comment approach this time around. That was a brilliant way to lampshade their previous characterisation. Interesting to read. Europe has quite the variety when it comes to takes on the Disney canon, but I remember Carl Barks specifically envisioning Magica as Neapolitan. My girlfriend herself hails from Naples, and I can guarantee there's a lot of stunners down there, so that particular - not to mention positive - stereotype about the city holds true to this very day. Maybe the only change I disliked is Gyro Gearloose being reworked into pretty much a G-rated Rick Sanchez. On the plus side, it's still Rick, and Rick works in every context. 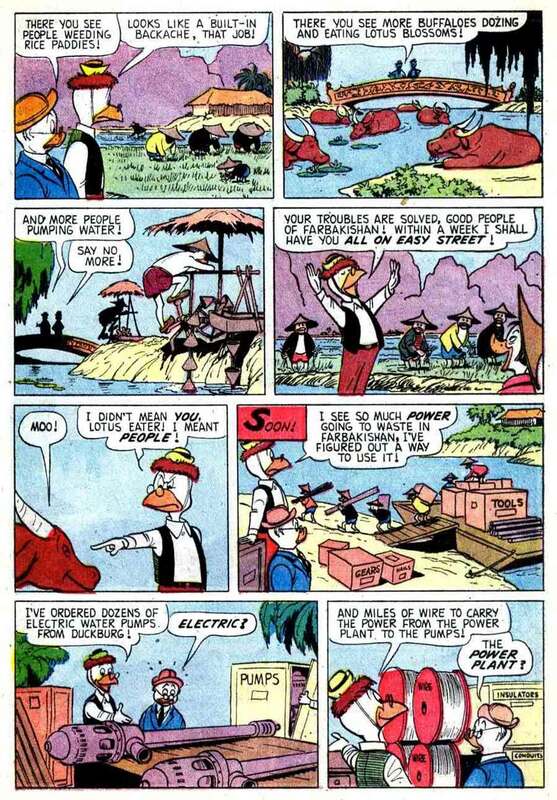 On the other, it's rather jarring compared to the awkwardly shy inventor from most comics' canon and the 1987 series, but even then it's worth noting that Gyro Gearloose wasn't intended to be strictly amicable to begin with; on the contrary, his lack of social skills - what with him being always busy inventing stuff (head over heels about it and all) and rarely going outside as a result - made him introverted, which is another kind of social anxiety in itself. Gyro is... complicated. But we love him either way. Also yeah, as I just said, even the most drastic changes like Gyro have a bit of truth to them in the canon. Same goes for his ego. Pretty cool! I like it.